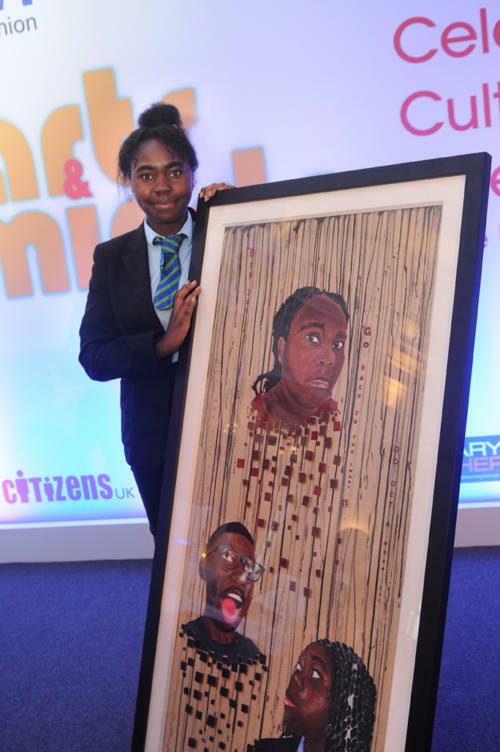 A pupil from a Telford school is celebrating today after her artwork was crowned overall winner of the 2018 Arts & Minds competition organised by NASUWT – The Teachers’ Union. The entry had already been selected from hundreds of entries from across the UK as a winner in the secondary school artwork competition. It went on to be chosen as the overall winner by TV presenter and Arts & Minds competition chief judge Gok Wan. Grace received her award at a national awards ceremony in London. “This piece is striking. There are so many deep messages going on. The accuracy of the faces portrayed is amazing. “I have never met any of these people but I feel I know them. The piece is absolutely beautiful. “Huge congratulations to Grace and her teachers at Ercall Wood Technology College. “This was a very emotive piece and each picture tells a strong and important story with the detail of the facial expressions. “The images are very powerful and the words add to the overall message. “There is clearly a lot of thought and feeling that has gone into this piece, you can see the effort Grace has put into its creation.